Lesson Planning 101 teaches that students must be engaged in the lesson for learning to take place. Charlotte Danielson of the Educational Testing Service states students should not simply spend “time on task” but should be actively involved in the curriculum. She calls it “minds-on learning.” In fact many researchers have shown that teachers who are most successful develop activities with students’ basic psychological and intellectual needs in mind (Ames, Alderman & Midgley, and Strong, et. al.). Those statements sound good to me. I agree with them, however, I often feel as if I am doing a frantic tap dance attempting to keep everyone focused and learning at the same time. Spinning plates is the best way I know how to describe delivering instruction in a classroom that has quite a menu of interruptions from loose teeth, unannounced visitors, and the ever squawking intercom. From time to time the content I teach actually gives me aide and comfort and makes my tap dancing steps a little less difficult. World War I gives me many opportunties to catch my breath as I am able to present one interesting idea concerning the war after another that successfully engages students. The Georgia standard I’m most concerned during this time is SS5H4(a) which involves German attacks on U.S. shipping during the war in Europe and how it eventually led to our involvement in the war. After we have discussed the causes of the war (another post for another time) we take a look at the German U-Boats and their attacks on merchant and passenger ships especially the British passenger liner, Lusitania, where several hundred Americans were killed. Students generally take a look at passenger recollections of the event at great websites like Lusitania: Lest We Forget. We debate the question if it was correct for the Germans to fire on the passenger liner and through a power point I've created we take a look at evidence ending in a 2006 underwater expedition that confirmed the Lusitania was carrying munitions. Then we take a look at camouflage. I show students an image of camouflage. “What’s this?” I ask. Hands begin to wave frantically. Of course most of my students know what I’m showing them. Many hunt with their fathers, even some of the girls. A lively conversation begins. Just like their daddies every young hunter has a story to tell. Other students are just as familiar with the military uses of camouflage. I tell students military forces across the world haven’t always used camouflage. It wasn’t until the savagery of World War I that it began to be used extensively in many different nations including the United States. I show students images of the British Redcoats and Patriot soldiers during the American Revolution. Nope, no camouflage there. Then I show them images of Civil War soldiers wearing the blue and the gray and the more colorful Zouaves. Again, we don’t find any camouflage. The old notion was that bright and bold designs would intimidate an enemy, but during the British experience in India leaders began to think differently about appearing bold and bright. The increased use of technology during World War I---namely the use of aerial photography for surveillance and the extensive use of trench warfare provided for the widespread use of camouflage and the need for a new type of military personnel---the camoufleurs. Their job was to devise camouflage schemes to make it difficult for the enemy to locate and destroy forces and equipment. Many of the camoufleurs were artists and designers during their civilian lives.The French established the first camofleur group in 1915. 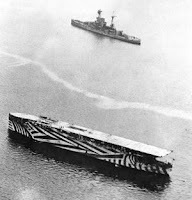 The British then picked up on the idea calling the camouflage Dazzle. Finally, the U.S. began to use it and referred to it as Razzle Dazzle. It’s at this point I share a few facts about Cubisim with students. The style of painting is thought to have begun in France around 1907 continuing through at least 1914 and beyond. Pablo Picasso is one of the best known Cubists as seen here with his L’Accordeoniste completed in 1911. Painters like Picasso liked to take objects and break them up and then present them in abstract form. So, as many students often say, just what the heck does Picasso and art have to do with a war? Picasso was correct. Art and war fused. Camouflage is a type of Cubism. Many painters that are well recognized today were camoufleurs in the U.S. military----Thomas Hart Benton, Charles Birchfield, and Grant Wood. Eventually the “school of Dazzle” was created and it was used extensively. Dazzle was camouflage used on naval vessels and it was quite dramatic using bright colors. Students are generally amazed by dazzle pictures. They do seem sort of strange looking. It was impossible to hide a ship out on the open ocean simply because they cannot melt into the background of sea and sky. Cubism helped to break the ship up and made it hard for the U-Boats to determine a ship’s speed and course. Without those two vital pieces of information a direct hit by the U-Boats was very hard to accomplish. Take a look at the Mahomet, seen here. How many bows could this ship have? In the beginning camoufleurs gave each ship a different design, however, as the war trudged on they devised specific designs that worked the best and used them over and over. It wasn’t just military ships that bore the Razzle Dazzle designs. Merchant ships and passenger liners become very colorful as well. There were no color photography at the time, however, a few people have used today’s technology to cover over old dazzle pictures so that we can get an idea of what it might have looked like. A terrific website that covers all aspects of dazzle painting is presented by Roy R. Behrens HERE. The advent of technology brought on dazzle and since technology is so fluid it effectively ended dazzle painting as well. Once radar began to be used dazzle camouflage was unnecessary. The extensive use of airplanes during warfare after World War I also made Razzle Dazzle obsolete, however, after the Japanese air power was diminished in the Pacific the Americans used some dazzle painting during World War II. After the war dazzle painting soon began to be seen in civilian life in drawings, paintings, cartoons, clothing, and even painting on vehicles. The Behrens site gives several examples of civilian dazzle painting and goes into detail concerning the British efforts with dazzle painting. Getting back to student engagement....after students have drawn their own ships and created their own dazzle camouflage designs it is very hard for them to forget the reasons why the United States was dragged into World War I. Follow this link if you would like to see my current posts. Ames, C. (1992) Classrooms: goals, structures, and student motivation. Journal of Educational Psychology, 84(3), 261-271. Alderman, L.H. and Midgley, C. (1998). Motivation and middle school students [Eric Digest]. Champaign, Il., Eric Clearinghouse on Elementary and Early Childhood Education (ERIC Document Reproduction Service No. Ed 421 281). Danielson, Charlotte. (1996). Enhancing professional practice: a framework for teaching. Alexandria, Va., Association for Supervision and Curriculum Development. Strong, R. , Silver, H.F., and Robinson, A. (1995) What do students want? Educational Leadership, 53(1), pages 8-12. Since I live very close to The Pentagon and other military offices, I've noticed that the camouflage is now digital! For a while there was a camouflage that was called, 'popcorn'. There is a lot of R&D put into the study of camouflage and what works best in what environments. And even though camouflage wasn't known really until WW1, Roger's Rangers of the American Revolution were known to wear green "uniforms" and although not technically camouflage in the modern sense of the word, was very much camouflage when you consider the modus operandi of Roger's Rangers (the forerunner and ancestor of the modern day American Special Operations). Additionally, Camouflage is part of the military's use of camouflage, concealment and deception. And indeed, concealment is part of cover and concealment. I think just the use of these words lend themselves to the understanding of how they relate to each other. But during training we were always taught how to properly apply camouflage to the light and dark areas of our faces, hands, and neck (whatever would be showing). Even body camouflage comes in different colors (black, dark green, light green, loam, sand, tan, etc). The way they apply camouflage in Hollywood is 9 out of 10 times wrong, but it looks good and that's all that counts. All this said, camouflage has almost become a thing of the past. Night vision and IR vision allows the U.S. military to "own the night." With these items you can see body heat and camouflage does you little good. However, modern camouflage uniforms attempt to overcome this by placing some sort of IR resistant chemical in the uniform itself. There is also a IR "Friendly fire" dot on each arm so that during combat the dots can be seen by friendly planes and tanks and other weapons in an effort to decrease deaths by friendly fire. Well, I just noticed how long this is and I suppose I should have posted it as a post on my own blog. But I liked your post and just wanted to comment on it. True. Involvement leads to better understanding. Lessons from experience are really different but sharing these experiences can make a difference in everyones life. What a great collection of stuff, nicely done! Smithsonian Magazine (or was it Natural History?) had a wonderful story on an artist who figured out that much of nature uses camouflage, but was unsuccessful in getting the various militaries to see things his way until late in WWI. Abbot Thayer? Drat -- now you've got me hooked on one more blasted thing I need to look up! Thanks for the the added info and comments everyone. I hope you check out the Behrens website. It is MOST excellent. Eric....never worry about a long comment. I don't mind them at all. Two points of interest. (1) It was the South African war that made the British Army adopt Khakhi uniforms. (2) It was the visit of HM the King George V to the Dazzle trials that clinched the deal. The stuffed shirts thought Dazzle "unseamanlike!". The King, a younger son,served as a career naval officer, in the royal tradition. He was good at it. His elder brother died and George became King. He visited Dazzle and was invited to play the role of U-Boat commander. A trained gunnery officer, he missed 3 times. He therefore ordered Dazzle be taken seriously - this not only as CinC but as a respected naval professional. Many allied seamen owe their lives to HM. I never realized that connecting art and war would be so simple. As a special education teacher, I completely understand the challenges of keeping students engaged and on task with the plethora of distractions that occur during a single lesson. Because of all those challenges, connecting to their interests and background knowledge is very important. I’m located in the suburbs of Chicago, IL and therefore can’t rely as heavily on a majority of students with hunting experience. That being said, it looks like the images of the Dazzle painting on ships are very engaging in themselves and could be used alongside some other examples of visual illusions to help engage student interest. I really like this lesson plan and how it connects past to present, civilian to military, old to new technology, and artistic to militaristic. Thanks for the information.